Pericytes are one of the two cell types that form the blood vessel. The other being endothelial cells, which form the inner lining of the vessel wall. Pericytes, or perivascular cells, are vascular smooth muscles cells that surround endothelial cells. Pericytes have many functions including roles in regulation of angiogeneseis and survival of endothelial cells. 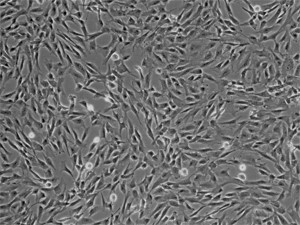 Brain Pericytes cryopreserved, proliferating in culture and GFP labeled. Retinal Pericytes cryoperserved or proliferating in culture. Media and supporting solutions for the culture of pericytes.